The Dell EMC SC9000 Storage Array Controller provides an ideal solution for large-scale storage, high-end workloads and distributed enterprise environments. 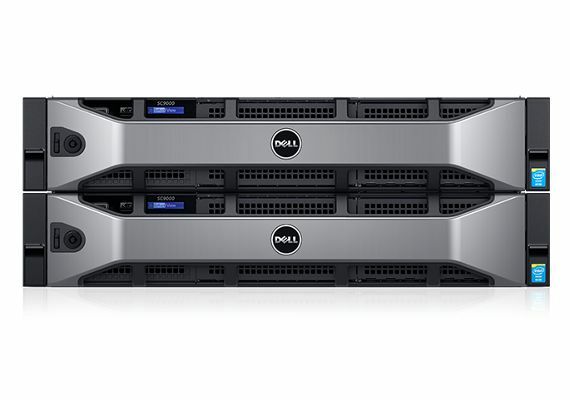 Dell EMC’s latest flagship array offers all the industry-leading capabilities of the SC Series line in a fully upgraded, more scalable system leveraging Dell’s 13G server platform. Turbocharge your data center and lower TCO with the fast, highly scalable Dell EMC SC9000 Storage Array. Although a single SC9000 storage array provides quick, modular expansion to over 3PB raw SAN and/or NAS capacity per array, it can also be interconnected with other SC Series arrays in larger federated systems, elevating and abstracting data control across your environment. Included Live Migrate “storage hypervisor” feature lets you move volumes non-disruptively between arrays without remapping hosts. Included Volume Advisor proactively monitors all arrays for the optimal volume placement, based on customiseable policies. Innovative all-flash and hybrid SC9000 solutions can revolutionise the speed and impact of your applications. Intelligent multi-tier SSD capability, new 12Gb SAS backend, and a wide range of HDDs and ultra-dense expansion options give SC9000 the power, throughput headroom and ultimate flexibility to meet ever-changing workload demands. With the Dell EMC SC9000 storage array, flash becomes practical and cost-effective at any scale, extending its proven competitive advantages to more aspects of your data-driven business. Redundant, hot-swappable components make the SC9000 a resilient, easy-to-deploy and highly available solution. Add capacity quickly with any of five supported expansion enclosures. Customise I/O connections to multi-protocol SANs (FC, iSCSI and FCoE) and support file storage from the same pool via the optional FS8600 NAS appliance. The Dell EMC SC9000 storage controller, the flagship product in the SC Series family of arrays, provides the ideal solution for large-scale systems, high-end workload performance and distributed data centre environments.